Shawn Lauvao (born October 26, 1987) is an American football guard for the Washington Redskins of the National Football League (NFL). He was drafted by the Cleveland Browns in the third round of the 2010 NFL Draft. He played college football at Arizona State. Lauvao started his last 33 games at Arizona State—17 at left guard, 12 at left tackle and four at right tackle. He earned Second Team All-Pac-10 honors during his junior and senior years. Although playing the left tackle spot in college, Lauvao projects as a guard in the NFL. He drew comparisons to Kynan Forney. He was drafted by the Browns in the third round (92nd pick) of the 2010 NFL Draft. 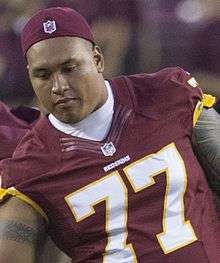 On March 11, 2014, Lauvao signed a four-year, $17 million contract with the Washington Redskins. He took over the starting left guard position in the Redskins' offensive line after the previous starter, Kory Lichtensteiger, switched over to center. In Week 3 of the 2015 season, Lauvao exited the game early with an ankle injury. On September 29, 2015, he was placed on injured reserve. ↑ "Shawn Lauvao Draft Profile", CBSSports.com . ↑ Jones, Mike. "Redskins sign guard Shawn Lauvao". WashingtonPost.com. Retrieved 11 March 2014. ↑ Clarke, Liz (August 6, 2014). "Gruden: Kory Lichtensteiger a pleasant surprise at center". WashingtonPost.com. Retrieved 2014-08-09. ↑ El-Bashir, Tarik (July 30, 2014). "Jay Gruden talks read option, Shawn Lauvao, Pierre Garon and more". CSNWashington.com. Retrieved 2014-08-09. ↑ Czarda, Stephen (September 29, 2015). "Redskins Sign Dunbar, Foster; Lauvao, Rogers Placed On IR". Redskins.com. Retrieved September 29, 2015.